Katy Perry is one of the biggest pop stars of our time. She's young, bright, talented, has an amazing voice and some mad dancing skills. Katy is a singer, a songwriter and can play a dozen of instruments! Even if you're not a fan of contemporary music, I bet you heard at least one of her bangers like "I Kissed A Girl", "Hot And Cold", "Firework" or the recent "Dark Horse" that has 1.4 billion views on YouTube. So, as you can see, this young lady is definitely a major player in the music industry, and she's influenced by a whole "army" of up-and-coming artists who look at her as a role model. Alright, let's check out some awesome facts about Katy Perry, including her personal life, her pets, her music and everything else in between. - Katy was born on October 25, 1984, which makes her 31 years old. Her hometown is Santa Barbara, Cali. Perry is not her real surname - it's Hudson. Well, her dad's Hudson, but her mom's Perry. Get it? So, why did she change it, anyway? She did it because she didn't want to get confused with Kate Hudson, a famous actress. - Awesome facts about Katy Perry: she used to be in a relationship with Travis McCoy. It was an on and off kind of thing, and they "broke up" officially in 2006. She met her ex-husband, Russel Brand, when she threw a bottle at him! Aha, it's like your perfect script for a romantic comedy! - More awesome facts about Katy Perry: she recorded her first LP when she was just 15 years old! That's pretty cool! I mean, yes, a lot of people write song(s) at that age, but a whole album - that's an entirely different story. - Miss Perry has her own perfume brand, called "Purr". They say it's pretty popular. - Katy left home when she was just 17 years old (yep, she wasn't even an official adult) to focus on her music career. Come to think of it, that was a really bold and balsy move, excuse my French :). - Soon after she left home the future superstar signed a deal with Island Def Jam and went to LA to work on her new album. Sadly, due to some legal issues and misunderstanding, the fans never got to listen to that album. - Not a lot of people know that before signing with Def Jam Katy had a contract with Red Hill Records. The label released her debut LP, Katy Hudson, but it wasn't a commercial success - not even close. 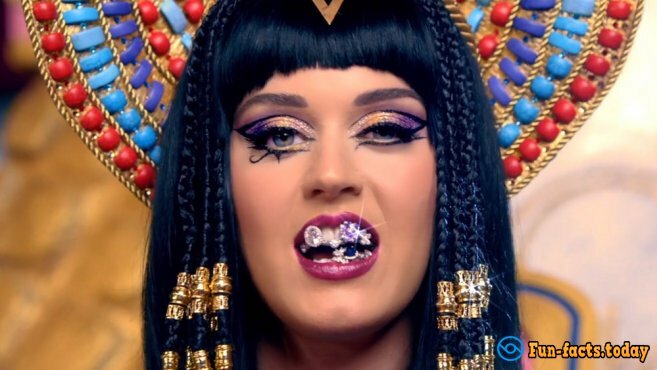 - Awesome facts about Katy Perry: Her net worth is 125 million US dollars, she used to sing gospel at her local church and her first hit was "I Kissed A Girl", a controversial but still a pretty dope song. - Katy Perry's third album on Def Jam, Teenage Dream, is the first-ever album by a female singer to have five #1 singles on the Hot 100 chart. Only Michael Jackson's legendary Bad album did the same. Aha, Katy is at the same level as MJ himself! So, that's Katy in a nutshell fo you!